Today I'm reviewing The Madeleine Project by Clara Beaudoux, which explores the life of Madeleine through the belongings she left behind in her Paris storage unit. The author moves into the apartment and when she finds that the cellar is padlocked and full of belongings, she contacts the previous owner's godson. He has no interest in the items, so the author saws through the padlock and begins itemizing on Twitter the boxes and suitcases full of memories. I'm at an interesting point to read this book, since I myself am going through a "cellar" full of things, letters and awards and treasures, to decide what to keep and what to discard. I wonder what a stranger would piece together about my life if she happened upon the things I've deemed worthy of keeping. Since the book is mostly a series of tweets, it's a very quick read, with time to pause and peruse the pictures a little closer. Here's an early page as the author begins to explore who Madeleine might have been. As a person who loves France and who loves a good historical mystery, I enjoyed peeking into the life of this French woman who would have turned 100 in 2015 if she had lived that long. Madeleine never married but she traveled and had a fiance who died in 1943, according to the author's findings. I might have found all of this paraphernalia left behind just mildly interesting, if not for the author's own notes in the middle of the book. In the midst of documenting Madeleine's life from 70 years before, the terrorist attacks in Paris occurred, killing 130 people. The author decided to continue documenting Madeleine's life to share the beauty that she found. I think what she actually shared was the connection between all people, no matter the hurdles. 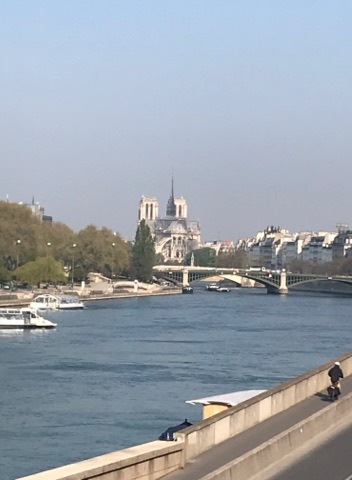 When you imagine Madeleine living in Paris throughout World War II and then you picture the author living in Madeleine's apartment through another series of attacks, you can see the strand, like metal, that connects them and all of us. The author turned toward Madeleine's treasures, the mundane things in life that make it wonderful and also give us the stamina to continue in the face of evil -- one sweetly-worded letter or a hard-earned diploma or a family picture. This book, translated from French, is more of a graphic novel than a traditional novel, but it still runs the gamut of emotion. The book will not be released until September, so put it on your list for some fall reading. Or scroll to the bottom and enter to win a copy. A young woman moves into a Paris apartment and discovers a storage room filled with the belongings of the previous owner, a certain Madeleine who died in her late nineties, and whose treasured possessions nobody seems to want. In an audacious act of journalism driven by personal curiosity and humane tenderness, Clara Beaudoux embarks on The Madeleine Project, documenting what she finds on Twitter with text and photographs, introducing the world to an unsung 20th century figure. Along the way, she uncovers a Parisian life indelibly marked by European history. This is a graphic novel for the Twitter age, a true story that encapsulates one woman’s attempt to live a life of love and meaning together with a contemporary quest to prevent that existence from slipping into oblivion. Through it all, The Madeleine Project movingly chronicles, and allows us to reconstruct, intimate memories of a bygone era. Sign up to receive their latest news and deals. You can enter the global giveaway here or on any other book blogs participating in this tour. Be sure to follow each participant on Twitter/Facebook, they are listed in the entry form below. Thank you for this! I am going to look for it, and maybe even try to read it in the original French. I can so relate to finding the belongings of an older person--it's what we did with our apartments. This sounds really good, Paulita. Thanks for bringing it to my attention. There is something romantic and intriguing about finding a box of someone's belongings, no longer wanted or discarded and what it says about that person and their life. I'll look for this one. Thanks for your nice review. I'm glad you liked the interaction between Madeleine and Clara's life and situations. Francetaste, That's a great idea to read it in French -- with the limited 140 characters it should definitely be do-able. Jeanie, You're right, it is kind of romantic. Francebooktours, Glad to have the opportunity to read the book. I enjoyed reading this book. I agree it is more of a graphic novel. Great review! !